A second birthday book: The Man Who Ate the Zoo by Richard Girling is the biography of Francis (Frank) Buckland who lived 1826-80 and can best be described as a naturalist populariser. His father William Buckland was a famous naturalist, and also Dean of Westminster. The book is chronological in its layout, starting with something of Buckland’s father William Buckland. Who coined the term coprolites to describe fossilised faeces. An early geologist he was also a theologian, rising to become the Dean of Westminster and by this connection his son Frank was exposed to the best in society from a young age. Girling writes less of Buckland’s mother but there is a rather poignant letter to him from her as he leaves at the age of five to go to boarding school. It is loving but bemoans his impatience and lack of obedience, a letter I might write to my own son! Buckland’s life at school and then university was unremarkable from an academic point of view but rather exotic. At school he seems to have spent a great deal of time dissecting any number of animals which came under his hand including numerous domestic cats. At the time this appears to have been unusual but no cause for concern. At university he kept something of a menagerie including a bear, named Tiglath-Pileser. Following university Buckland trained as a surgeon, travelling to Paris in 1849 to dissect victims of cholera, who were in ample supply – the disease killed 19,000 people in that city. After training he joined the Life Guards in London as a surgeon. This does not appear to have been an onerous job since he managed to write a great deal during this time and dissect pretty much what he wanted. He left the army in 1863, and took up residence in Albany Street, close to London Zoo and married Hannah Papps, who had borne him a child some years previously, out of wedlock – which would have been scandalous at the time. The child, Physie (Francis John), died at the age of four and a half. Writing then became Buckland’s career. He published Curiosities of Natural History and wrote copious articles for periodicals such as The Field. The house at Albany Street played host to the famous and the “freakish”. Buckland’s interest in nature extended to the unusual in humans: giants, dwarves, hairy women and Siamese twins. Somewhat quaintly the author claims we no longer have the terrible freak shows of Victorian times. I suggest he peruse a few documentaries on TV! Buckland was a member of the British Acclimatisation Society whose purpose was introducing new domestic animals into the United Kingdom for the purposes of feeding the masses more cheaply, or better for the same sum. This led to a life of eating all manner of strange and exotic creatures. Perhaps happily little came of their investigations. Buckland was appointed Inspector of Fisheries in 1867. This started in inland waters where he travelled the country inspecting salmon rivers and also worked on fish farming, eventually sending salmon eggs around the world to populate New Zealand rivers. He was keen to restore the inland waterways to make them liveable for salmon both in terms of their cleanliness and the infrastructure in them – putting salmon ladders beside man-made weirs. Subsequently he worked on marine fisheries. His final substantial work was a report on marine fisheries: Report on the sea fisheries of England and Wales. The Victorian period was a time of change, early in the 19th century the first animal protection legislation was enacted and towards the end there was a growing realisation of the impact of man on the environment. In a way Report on sea fisheries was a swansong to the old way of thinking, it put forward the idea that the sea fisheries were effectively limitless in their capacity but called for more research into these critical food animals. Buckland, and his father, lived in the time of Charles Darwin although his father died before the publication of On the Origin of Species in 1859. The origins of life had been a topic of scientific interest to which both Bucklands made their contribution, on the side of the what we would now call the Creationists. I couldn’t help thinking of Michael Faraday and David Attenborough when reading about Frank Buckland, neither can claim to be the greatest of scientists but their impact through communicating a wonder of science and nature (and a genuine deep knowledge of them) has been enormous. 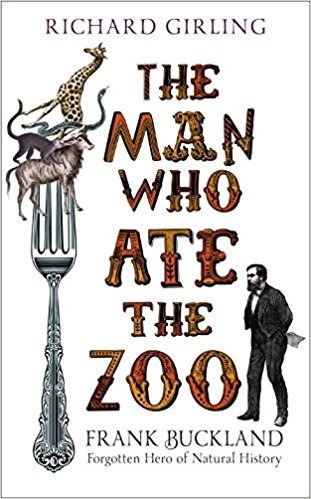 The Man Who Ate the Zoo is a pleasant enough read, Buckland is an interesting character and left a legacy in fisheries research.